Because relaxing over a good meal is one of life's great pleasures, we've designed our menus to reflect the fresh, innovative cuisine of New Zealand. Our menus are designed by our consultant chefs and wine experts. Showcasing the best of fresh, innovative New Zealand produce, our Business Premier food and beverage is designed to tempt even the busiest traveller. Choose from a range of carefully selected New Zealand wines as well as Champagnes and port. Enjoy a selection of mouth-watering meals accompanied by superb New Zealand wines on our Premium Economy menu. With the Economy menu you can enjoy delicious, fresh meals complemented by a great selection of New Zealand wines from the onboard cellar. A simplified menu is served in Economy Class on Tasman and Pacific flights. 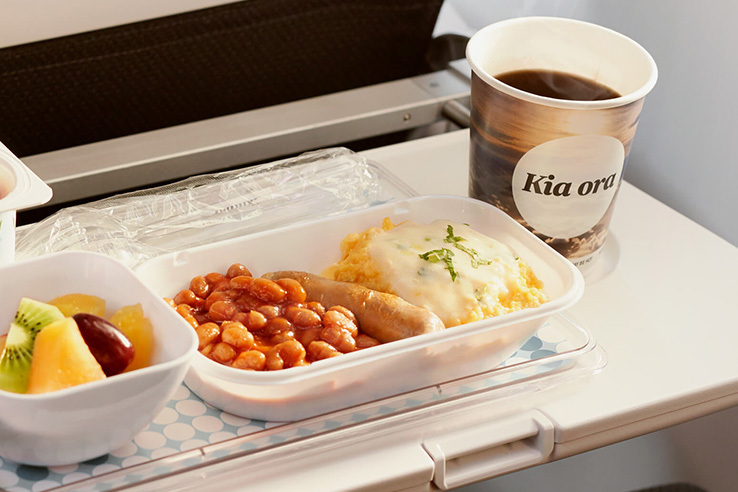 Your inflight food & beverage options will differ depending on the product you have chosen. Our Koru Hour flights offer additional snack and drink choices. Start the day with tea or coffee and a muffin or cookie. On early evening Koru Hour flights, New Zealand wines, premium beers, cider, L&P and Coke Zero are added to your beverage choice, served with cheese and crackers or a savoury snack. Read more about Koru Hour flights. 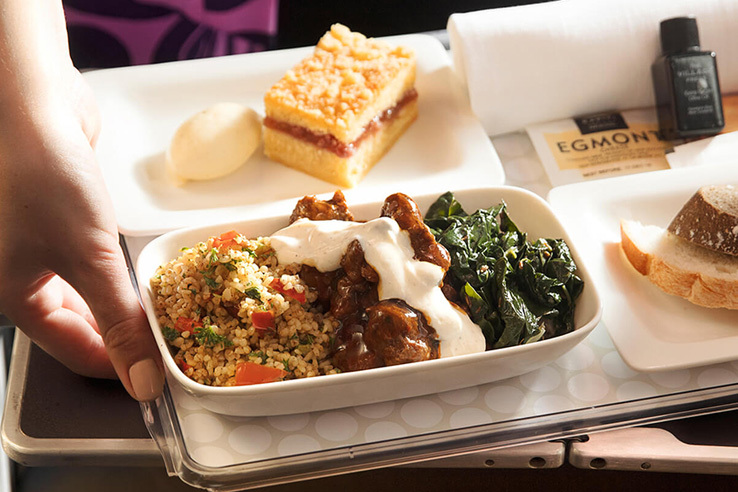 Designed by six consultant chefs and wine experts, our menus offer the finest inflight cuisine. Based in London, Beijing, California and Auckland, their global expertise innovate our meals. From internationally-respected chefs, to wine judges, critics and editors, you can rest assured you'll be well catered for. Read more about our consultant chefs and wine experts. We offer a variety of pre-order special meals to cater for a wide range of dietary and cultural needs. If you can't find a suitable meal from the options we offer, you're welcome to bring your own food. Please ensure it doesn't require heating or refrigeration. Also remember to plan your meal around the security screening restrictions on liquids, pastes and gels.